Posted on February 1, 2019. Subscribe to our blog by email. Pat Garcia-Gonzalez at the annual meeting of the Nigerian Society of Hematology and Blood Transfusion. Photo by Martin De Bruin. Pat Garcia-Gonzalez, co-founder and CEO of The Max Foundation, has spent the last 15 years facilitating access to cancer treatment in low- and middle-income countries. 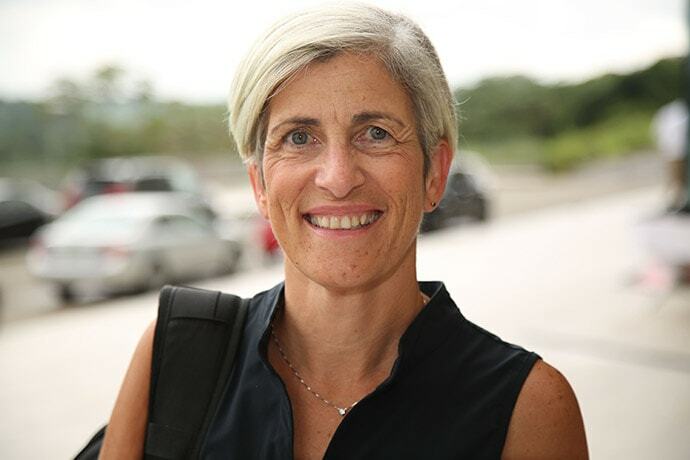 In this Q&A with Global Washington, she shares the many lessons she has learned in this work, and how both cancer treatment and patients’ access to treatment globally has changed. You can also catch her talk on February 12, 2019, at The Pacific Science Center: “the Good, the Bad, and the Ugly.” Pat will discuss the state of global cancer treatment and The Max Foundation’s strategies for removing barriers to access. What lessons have you learned in 15+ years working in treatment access? The first lesson I have learned is that it is possible. It is actually possible to provide access to innovative cancer treatment for patients living in low- and middle-income countries, even when the treatment might be long-term, and in some cases, indefinite. I have also learned that for every patient we are able to rescue, we are not only saving the life of that particular individual, but we are also saving the lives of many others in their family and their communities. We even have a great impact on the availability of oncologists and hematologists by providing the means for them to successfully treat patients and inspiring medical students to want to become oncologists and hematologists. I have also learned that nothing is simple; these problems are often complex and require great commitment from multiple partners and a great deal of patience, hand-in-hand with a “never give up” attitude. Finally, I have learned that no matter how hard it is, it is worth it. What is different from when you started? 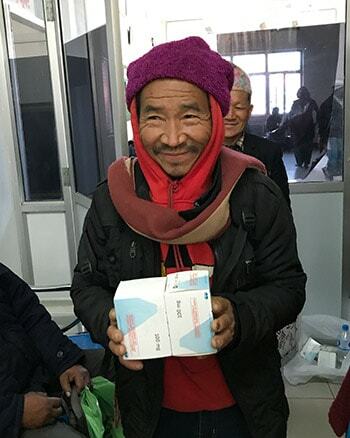 A Nepalese patient accesses free cancer medication, donated by Novartis and distributed by The Max Foundation. Photo provided by The Max Foundation. So much has changed since we started The Max Foundation. When we first began, targeted cancer therapies didn’t even exist! Then, of course, a miracle happened: Novartis developed imatinib (Glivec®) – this incredible drug that basically changed the nature of chronic myeloid leukemia (CML) turning the diagnosis from a death sentence into a disease that people could live with. Then, just as remarkable, a second miracle – the company decided they would provide access to those in need in low- and middle-income countries. They partnered with us to co-develop what went on to be known as the Glivec® International Patient Assistance Program (GIPAP). In the years that followed, more than 80,000 patients in low- and middle-income countries gained access to treatment through the program. Today, Novartis is still a key partner, but our relationship has evolved and so have our access solutions. Now, rather than distributing drug through GIPAP, we have launched our own patient-centered model for treatment access called Max Access Solutions. Instead of only distributing Novartis’ Glivec to patients with CML, we now have 5 different pharmaceutical partners and a portfolio of 8 different targeted therapies treating 11 different types of cancer. By leveraging all of our learning from GIPAP and the power of strategic collaboration, we’ve created a better way to approach humanitarian access in Max Access Solutions. Beyond our own organization and the advent of targeted therapies, I think the biggest change is probably awareness. The global community seems to be paying more attention to the global cancer epidemic and that is encouraging. In 2015, the United Nations Sustainable Development Goals included reducing premature mortality from non-communicable diseases (NCDs) like cancer. The Access to Medicine Index now includes an oncology report. And it seems more and more NGOs are working on cancer in low-resource settings, particularly in Africa. What challenges lie ahead in treatment access? Looking ahead, the biggest challenge will be the coming tidal wave of new cancer cases. As we have heard from the new projections, by 2040, the number of new cancer patients diagnosed each year is expected to nearly double to more than 28 million worldwide. Of those, 7 out of 10 will live in low- and middle-income countries with no way to access the treatment they need. Meanwhile, the cancer divide is only getting wider. Precision oncology, personalized treatment – whatever you want to call it – the newest, best treatments for cancer require very specialized diagnostic tools that are not available for patients in most countries. Add to that the high cost of the treatment itself, and you can see how it seems like equal opportunities for patients to survive are only getting farther and farther away. We have our work cut out for us. We will only be able to address the cancer epidemic by working together as a global community of partners and collaborators. Pat Garcia-Gonzalez stands with CMLAG Patient Group & Korle Bu hospital staff in Accra, Ghana. Photo by Martin De Bruin. What would you want the public to know? I want the public to know that they can be a part of our solution. Yes, global cancer statistics are overwhelming. Yes, many cancers and treatments are too complex for low-resource settings. But there are treatments that can be safely given, patients that can be safely rescued, and tens of thousands of premature cancer deaths that can be avoided. In those cases where treatment can be safely given, we have a fantastic patient-centered model, a dedicated global team, and committed partners and donors. Together, we’re currently delivering more than 4,000,000 daily doses of targeted cancer treatment to people in low- and middle-income countries every year. With your help, we can do even more. Visit us online to learn more about our work and join our email list, and come hear my talk at the Pacific Science Center on February 12th!